Due to the need for repairs, the Cape May County Bridge Commission has announced that the Townsends Inlet Bridge (connecting Sea Isle City and Avalon) will be closed to all v ehicle, pedestrian and bicycle traffic starting September 17. While repairs are underway, construction crews will be working extra shifts; however the bridge is not expected to re-open until May, 2019. CLICK HERE to read more. The Sea Isle City Environmental Commission will host their annual Autumn Beach Clean Up and Dune Grass Planting event on Saturday, October 13, 10:00 a.m. to 12 noon (rain date: October 14). During this important gathering, volunteers will clear trash and debris from Sea Isle's shoreline and plant grass seedlings that will help strengthen our dunes. Pre-registration is not required. Volunteers are asked to sign-in on the day of the Clean Up at JFK Boulevard and the Promenade. Complimentary tee-shirts will be given to volunteers (while supplies last) courtesy of Approach Clothing Company, located at 6300 Landis Avenue. Volunteers will also be treated to a complimentary luncheon at Mike's Seafood Restaurant on Park Road, courtesy of the Monichetti family. Volunteers will also receive coupons for free ice cream cones at Spinners Pizza, Ice Cream & Grill, located in Spinnaker on the Promenade at 38th Street. For more information about the Beach Clean Up, phone 609-263-2081. 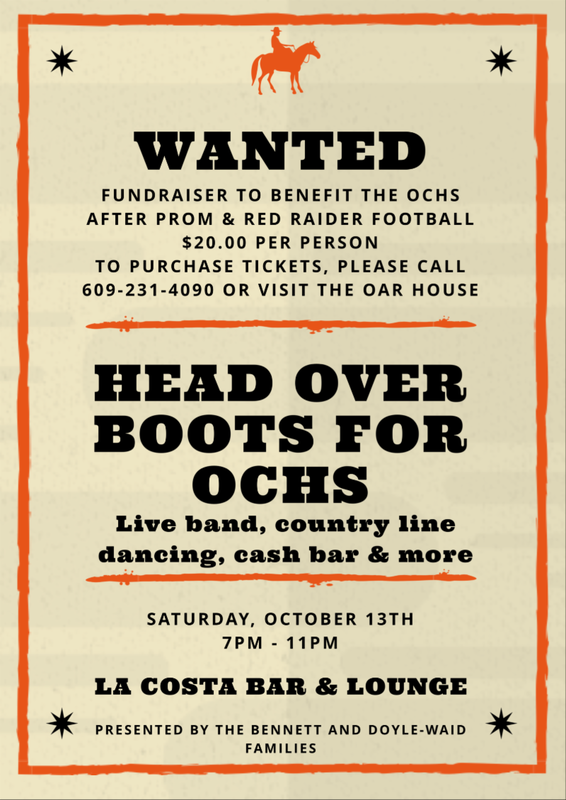 The Bennett and Doyle-Waid families will host a "Head Over Boots" fundraiser on Saturday night, October 13, from 7:00 to 11:00 p.m. at LaCosta Lounge, JFK Boulevard and Landis Avenue, benefitting the Ocean City High School After Prom and Red Raiders Football programs. The event will feature live music, country line dancing and more! Tickets cost $20 per person. For ticket info, phone 609-231-4090 or go to The Oar House Pub on 42nd Place. CLICK HERE to read more. There's Still Time to Enter the Halloween Parade! Sea Isle City's Division of Recreation will host the City's annual Halloween Parade & Family Dance Party on Friday, October 19. The parade will begin at 7:00 p.m. and run along Landis Avenue (45th Street to JFK Boulevard), featuring a variety of costumed participants, bands and entertainers. Want to Appear in the parade? Registrations are now being accepted from families, businesses, organizations and other folks who wish to appear in this year's parade. Prizes will be given to the parade's winners. CLICK HERE to download a Parade Entry Form or phone 609-263-0050 for info. Afterwards, bring your family to the annual Halloween Dance Party at the Excursion Park Band Shell, which begins immediately following the Halloween Parade. For more information, please phone 609-263-0500 or go to www.VISITSICNJ.com. 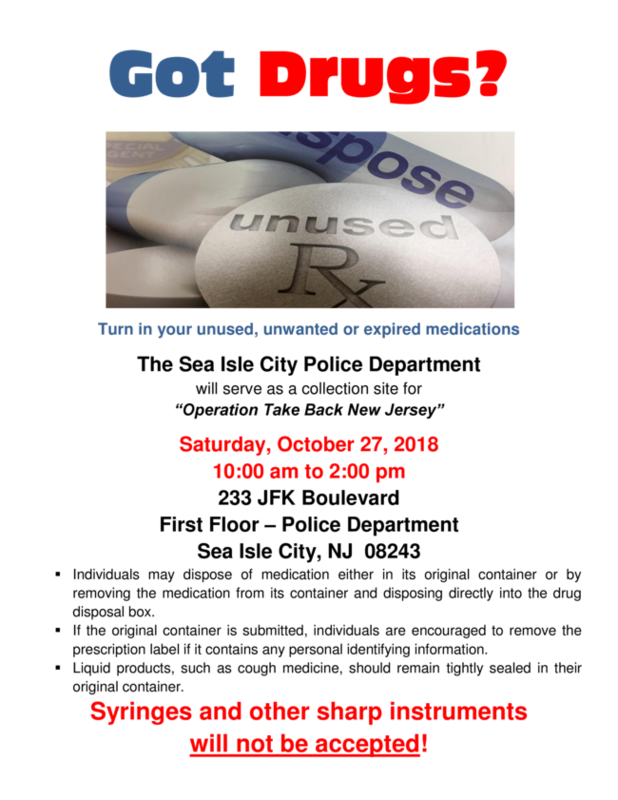 As part of "Operation Take Back New Jersey," the Sea Isle City Police Department will host a free Prescription Drug Disposal Event on Saturday, October 27, from 10:00 a.m. to 2:00 p.m. at Police Headquarters (located on the first floor of City Hall, 233 JFK Boulevard). This event will allow the public to anonymously and safely dispose of unwanted/unused medications, which will then be properly destroyed by law enforcement officials. Individuals may dispose of medication either in its original container or by removing the medication from its container and placing it directly into the drug disposal box. If original containers are used, individuals are encouraged to remove prescription labels if they contain any personal information. Liquid products (such as cough medicine) should remain tightly sealed in their original containers. Needles and other sharp instruments will not be accepted. For more information, please contact Sgt. Bill Bradshaw 263-4311, ext 2302. CLICK HERE for an event flyer. In an effort to educate the public and continue the ongoing battle against the current opiate crisis, Sea Isle City's Municipal Alliance Committee will offer free Narcan training to interested individuals on Tuesday, October 30, 6:00 to 8:00 p.m. in the Sea Isle City Community Lodge, 300 JFK Boulevard. A limited number of lifesaving Narcan kits are available for this event, so please pre-register by October 25 by contacting Municipal Alliance Coordinator Kellie Seib at 609-263-4461 ext. 1222 or kseib@seaislecitynj.us. To learn more about Sea Isle's Municipal Alliance, please visit www.seaislecitynj.us. Goblins and Ghouls spending Halloween Night in Sea Isle City will have two fun ways to celebrate the evening. In addition to door-to-door Trick-or-Treating, which takes place from 5:00 p.m. to 8:00 p.m. in Sea Isle City, the Recreation Office will also host a "Trunk-or-Treat" event on October 31, from 5:00 p.m. to 7:00 p.m. in the Municipal Marina Parking Lot along 42nd Place (adjacent to the Welcome Center), where residents, businesses, and organizations are invited to distribute candy from their vehicle's trunks or open tail gates. A prize will be given to the best decorated vehicle. Please contact the Recreation Office at 609-263-0050 for more information or to reserve a spot for your vehicle during "Trunk-or-Treat." Traditional Trick-or-Treating also takes place in Sea Isle City on October 31 from 5:00 to 8:00 p.m. If you wish to greet visitors at your home on Halloween night, you can let Trick-or-Treaters know that you will be answering your front door on October 31 by contacting the Recreation Office and adding your address to Sea Isle City's "Trick-or-Treat Route" list, which will be available to families prior to October 31. For more information, please phone 609-263-0050. SAFETY REMINDER: While Trick-or-Treating, remember to wear brightly colored costumes that do not drag the ground, carry flashlights, have a planned route, and never walk alone. To learn more about Sea Isle City's fascinating past, visit the Sea Isle City Historical Museum, located on the first floor of the Sea Isle City Library at 4800 Central Avenue, or speak with a Historical Society member by phoning 609-263-2992. The Upper Township Wrestling Association invites all boys and girls (grades K thru 8th) to join the Upper Township Green Hornets Wrestling Team - including Sea Isle City kids! Free, no obligation "try it out" practices will take place October 29, October 30 and November 1. For more information, please email uppertwphornets@gmail.com, visit www.upperwrestling.com or call Head Coach Frank Sannino at 609-231-8528. Anyone can register for event cancellation text messages by texting "sicalert" to "84483" on your smart phone. You can also sign-up for event cancellation text messages and email alerts by going to the City's Visitors Website, www.VISITSICNJ.com, and clicking the "Rained Out" link on the home page. Once signed-up, you will receive alerts whenever a local concert, festival or other outdoor event has been cancelled, postponed or re-scheduled. CLICK HERE for the Public Works Home Page, where you'll find links to Trash & Recycling Collection Schedules, the Water & Sewer Department, the County M.U.A. and other useful information.